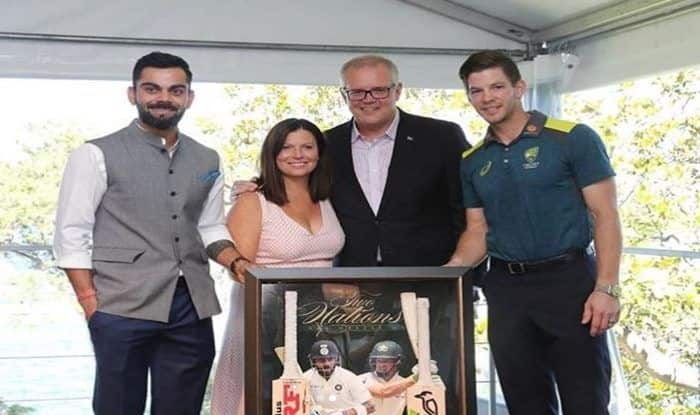 Indian cricket team along with their Australian counterparts were hosted by Australian Prime Minister, Scott Morrison at his official residence, the Kirribilli House in Sydney on the New Year's Day. After registering a memorable win over Australia in the Boxing Day Test by 137 runs, Virat Kohli and Co. are high on confidence and have moved to Sydney where they will play the fourth and final match of the series. The fourth Test between Australia and India will be played from January 3. On the day of the New Year, both Australia and India teams visited the Australian Prime Minister Scott Morrison’s residence to meet him. The whole of the Indian team was there alongside Tim Paine and Co. to meet and greet the PM. The Board of Control for Cricket in India (BCCI) took to Twitter to share the images of the meeting, the BCCI tweeted, “Striking a pose #TeamIndia & Australia at the Australian Prime Minister’s residence” Virat Kohli and Co. were in a dressing code wearing a white shirt, blue trousers , and grey Nehru jacket while the Aussie team was in Cricket Australia t-shirt and trousers. While the Indian team has taken an unassailable 2-1 lead in the four-match series, the visitors will retain the Border-Gavaskar trophy even if the series is drawn level at Sydney as they have won the previous series at home in 2017. On Day 5 of the MCG Test, after losing out the first session due to steady showers, Australia could only manage to add three runs to their overnight score of 258 for 8 as they were all out for 261 in 89.3 overs. India thus won a Test match at the iconic MCG after 37 long years when Sunil Gavaskar’s men beat Greg Chappell’s side in the 1980-81 series. Fittingly it was the legendary Kapil Dev, who had then played a major role taking five wickets in defending a low total while it was young Bumrah with match figures of 9 for 86, who was the hero this time for the tourists at the historic MCG. Australia even had an optional training session on New Year’s Day. Pacers Mitchell Starc, Josh Hazlewood, Pat Cummins and Peter Siddle skipped the session but Marcus Labuschagne, who’s been drafted into the side for the final Test, rolled his arm over in the nets.